Surya TV added Another Prithviraj film to their movie collections. 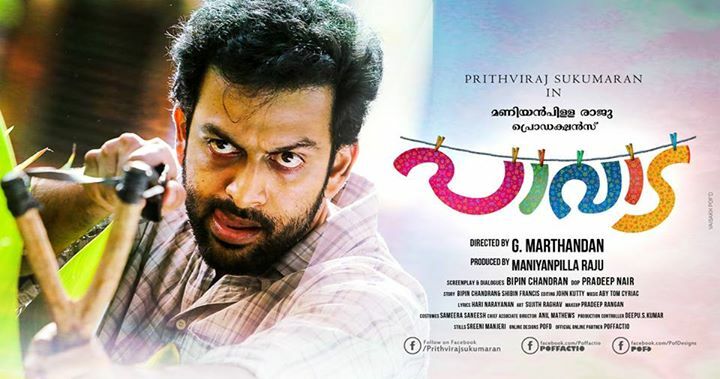 Paavada is a latest malayalam movie and its satellite rights purchased by Surya TV. Pavada movie story is written by Bipin Chandran and Shibin Francis. Screenplay of Pavada movie is made by Bipin Chandran and directed by G Marthandan. This is the 3rd movie of G Marthandan after Daivathinte Swantham Cleetus and Acha Dhin. Surya TV picked all the films of Prithviraj released in the year 2015. Picket 43, Ivide, Double Barrel, Amar Akbar Anthony, Anarkali are the films with Surya TV. Ennu Ninte Moideen is not sold to any channel and we will update the info very soon here. Paavada is produced by Maniyan Pilla Raju under the banner Maniyan Pilla Raju Productions. Prithviraj Sukumaran, Anoop Menon, Asha Sarath, Biju Menon,Miya George, Maniyan Pilla Raju, Sudheer Karamana, Chemban Vinod Jose etc are in the star cast of Pavada movie. Aby Tom Cyriac is composing the music of Pavada and Cinematography by Pradeep Nair. Prithviraj is playing the role of Joy in this movie and Mia doing female lead role. Anoop Menon as Professor Babu Joseph & Maniyanpilla Raju as Adv. Gunashekaran Nair doing other characters in Paavada movie. Paavada is scheduled to release on 18 December 2015. Surya TV is purchasing lot of latest malayalam movie rights, keralatv.in publishing all the latest updates of malayalam channels. We will bring more movie rights soon here to our readers. This week we will publish the details of Cristmas films 2015 of All Malayalam television channels. Stay tuned here for more updates, you can subscribe to us for All the latest updates. You can follow our facebook and google plus pages for latest malayalam tv news. i am a regular follower of this site, all the other sites and facebook pages posted that paavada is with asianet. can you please confirm this.